Some of you have likely spent a night at an airport. It’s also likely it wasn’t your first choice. But it might be now that the original flight control tower at Stockholm’s Arlanda Airport has been transformed into a luxury apartment. 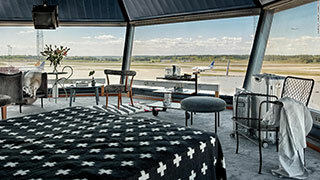 The disused tower is now home to a spacious, bright space offering panoramic views of the runways below. ARN partnered with vacation rental company HomeAway and Swedavia to reinvent the 80-meter-high tower as a destination that'll appeal to aviation geeks, design freaks and anyone who loves unique lodgings. Swedish multimedia artist Cilla Ramnek is the brains behind the aparment's Scandi-cool, minimalistic look. He used a 1960s gray-scale colour scheme, with pops of brighter hues and blue skies glimpsed through floor-to-ceiling windows. Most of the products incorporated into the apartment are available for purchase inside the airport. So far, stays in Arlanda's tower are being offered as contest prizes. Five winners will get to spend a night in the apartment, followed by a further three nights at a HomeAway rental of their choice. "It feels great to be able to offer international guests the opportunity to experience this hidden secret at Stockholm Arlanda. At the same time, we see this as an opportunity to showcase what we have to offer here at Scandinavia´s fastest growing airport," says Kjell-Åke Westin, Airport Director at Stockholm Arlanda. 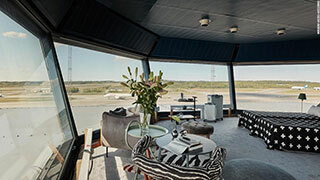 Winners will also get to a take a trip up to the balcony of the airport's new flight tower and enjoy a meal at airport restaurant Pontus in the Air, owned by acclaimed Swedish chef Pontus Frithiof.